What It’s About: Tourists in a series of catacombs arrive in a chamber where a crypt keeper tells them the stories of their deaths. 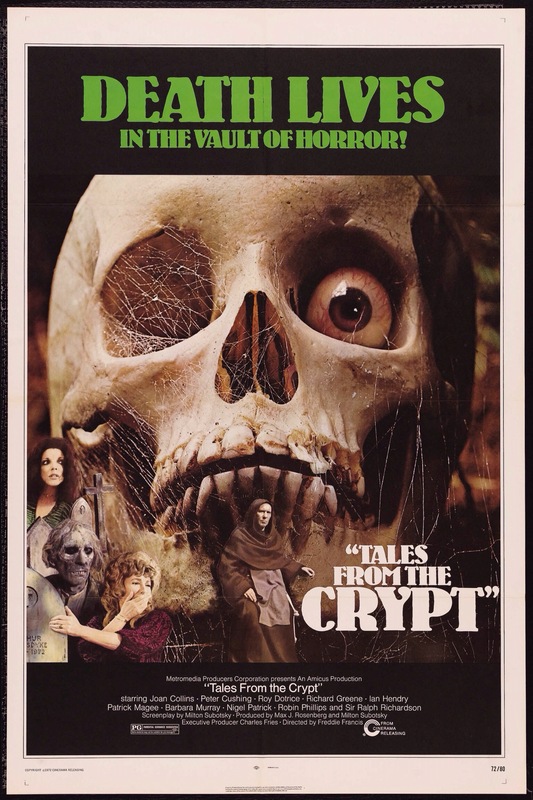 All of the stories are adapted from EC Comics stories printed in the titles “Tales From the Crypt”, “The Vault of Horror”, and “The Haunt of Fear”. Much as in the later HBO series the results vary in quality, but it’s one of the strongest anthology horror films from Amicus (or any other studio at the time!). Why Watch It Today? : In Peter Cushing’s segment “Poetic Justice”, pivotal events occur on Valentine’s Day. Given the source material, you can bet it’s a story with a lot of heart. You could say it’s a cut above the rest! This entry was posted in Anthology, Based on a Comic Book, Ghost, Holiday, Movie of the Day, Slasher, Zombies and tagged Amicus, Joan Collins, Peter Cushing. Sean, thanks for including some terrible puns in this!